Now that both of the boys are out of our bed I have slowly been gathering things to revamp our bedroom. Make it more of a "grown-up people" retreat. I had seen this lamp at target and loved it but didn't have the cash for it. Came back the next week and they were sold out. It was $20. Which isn't a lot compared to other look alike lamps. Like this cutie for $149. 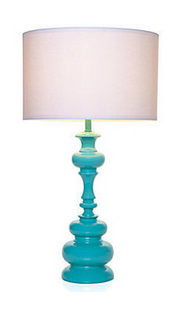 Seriously, even if i could I would never spend that much for a lamp. So Saturday I set out on a thrifty mission to find a lamp with that shape I loved and then revamp it myself- I get so many ideas from watching Design Star! Enter the $1 thrift store score! 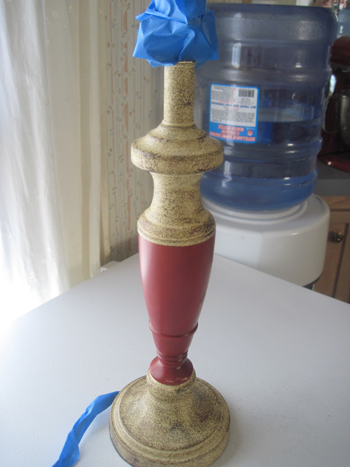 Tape off the top and the cord with painter's tape. And grab your materials! Tip #1 Apply at least two coats of primer. If your working with a non-porous surface like glass, ceramic or metal you may need three, also if your covering a dark or uneven color like I did. The primer not only eliminates the color but it sets the standard for how smooth and evenly your color will come out. I was up against two challenges- not only the bright red, but also those little speckles all over the lamp. I ended up doing 5 coats of primer just to be sure all those speckles were gone. 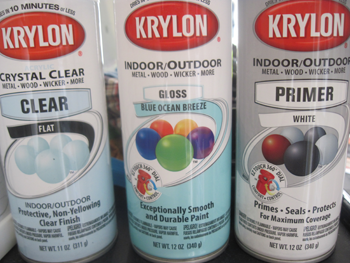 Tip #2 Apply paint in steady, thin horizontal strokes. Starting about two inches to the left of your lamp and stopping the same distance on the right. Stop spraying. Continue in the opposite direction, stopping the spray at the end. Be sure to begin at the top and work your way back and forth until you reach the bottom. 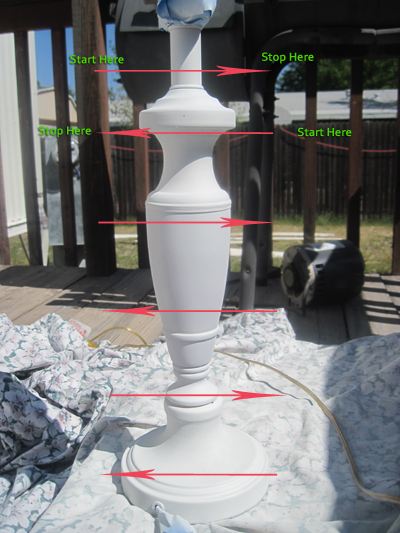 Paint one side, turn the lamp about 1/4 turn, repeat horizontal strokes to create a flawless, drip-less cover. Tip #3 Make sure you wait for each layer to dry. I waited 8 minutes between layers...it was also 80deg outside so that helped. The sealant coat only needs 2 minutes between layers. 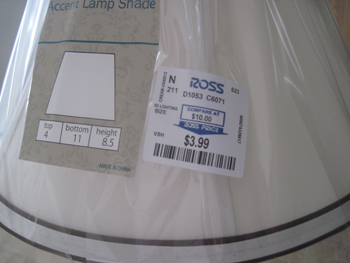 I also scored a super cheap shade at Ross. 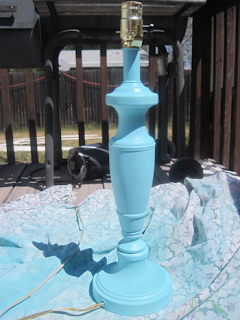 I would let the lamp sit outside for about 2 hours just until the fumes die down. Then add a bulb and shade! Now all I have to do is build the nightstand I scored on Clearance two months ago. 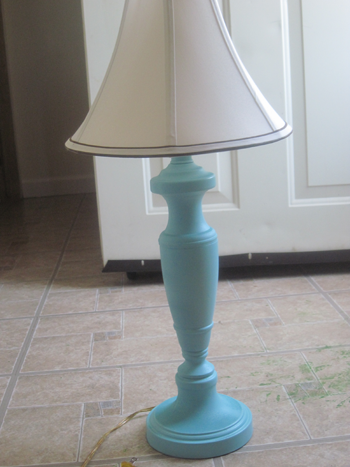 Then I'll have a place for my new lamp!